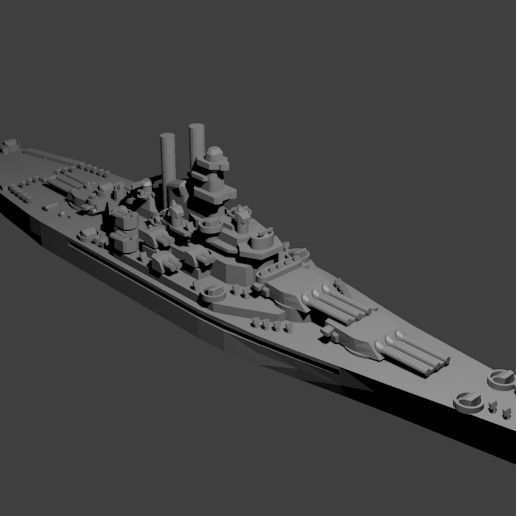 1/1800th scale Colorado Class Battleship model. Certain elements not to scale. The Colorado class of battleships were built after WWI before the 1922 Washington Naval treaty. To comply with the naval treaty, the USS Washington was cancelled at 75% completion and sunk as a target ship. They featured four twin turrets with 16 inch guns. They saw action in WWII. Maryland and West Virginia were present during the attack on Pearl Harbor. West Virginia was sunk, but raised and repaired. All three ships were scrapped in the 1950's.